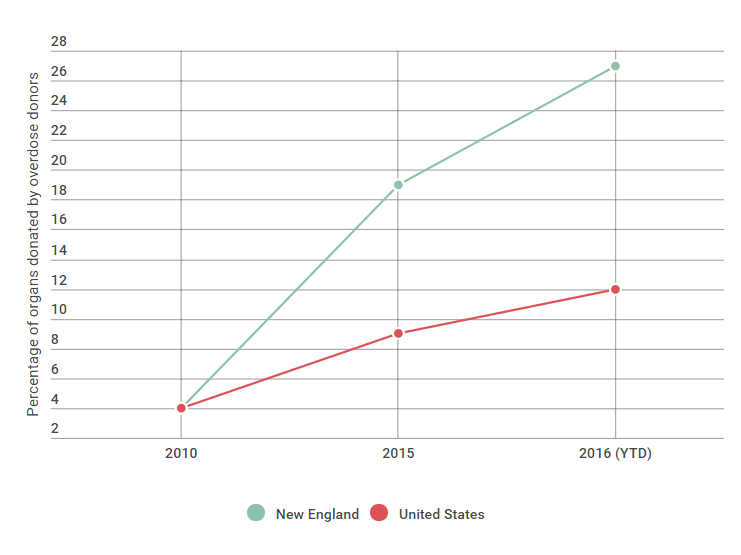 Opioid Overdose Deaths Cause Organ Donations In U.S. To Rise : Shots - Health News So far this year, more than 1 in 4 donations in New England are from people who died after a drug overdose — a much higher rate than in the U.S. overall, though it's not clear why. At his home in Haverhill, Mass., Colin LePage leafs through newspapers he shows to middle-schoolers to educate them about the dangers of drugs. On the final day of June 2015, Colin LePage rode waves of hope and despair. 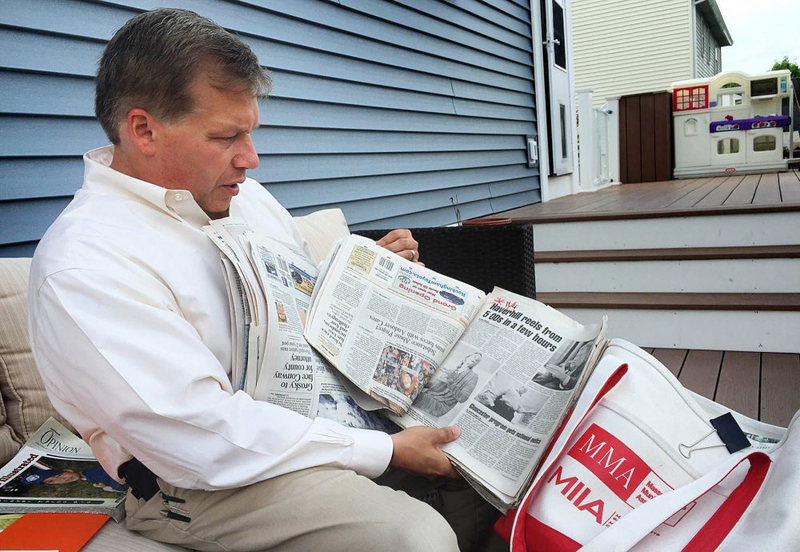 It started when LePage found his 30-year-old son, Chris, at home after an apparent overdose. Paramedics rushed Chris by helicopter to one of Boston's flagship medical centers. Doctors revived Chris' heart, but struggled to stabilize his temperature and blood pressure. At some point, a doctor or nurse mentioned to LePage that his son had agreed to be an organ donor. "There was no urgency or, 'Hey, you need to do this.' I could see genuine concern and sadness." LePage says, his voice quavering. The next morning, after another round of tests showed no signs of brain activity, LePage said goodbye to the son who'd been revived but wasn't fully alive. "I sat in a chair with him and held his hand," LePage says. "It wasn't clinical. It didn't feel like someone's gaining something here. I knew that someone was, and that's comforting that someone else has been able to have a little piece of my son and some of their pain is not what it used to be." Chris' liver is now working in the body of a 62-year-old pastor. His case is one among the nearly 900 percent increase so far in donations across New England since 2010. So far this year, more than 1 in 4, or 27 percent, of donations in New England are from people who died after a drug overdose. Nationally, that rate dips to 12 percent for the same time period. "It's remarkable and it's also tragic," says Alexandra Glazier, president and CEO of the New England Organ Bank. "We see this tragedy of the opioid epidemic as having an unexpected life-saving legacy." It's not clear why. Overdose death rates are high in New England, but not the highest in the country. Glazier says the 12 transplant centers in that region may be more aggressive about finding a match for patients with failing hearts, livers or kidneys. And she says New Englanders tend to be pragmatic about end-of-life decisions. "Most of these patients trust the fact that these donors are tested and they understand that their chance of dying while waiting for an organ is high," he says. Akoad says Lahey has not had any cases of HIV or hepatitis B or C transmission in recent years. That's the case at Mass General in Boston as well. Dr. Jay Fishman, associate director of the hospital's transplant center, says an organ from someone who used drugs is not necessarily risky and may even be healthier than other options. "You have to remember that as awful as this outbreak is, these are younger people who are dying, often with needles in their arms, and many of them were first-time drug users," Fishman says. "They weren't all addicts." Despite the increase in available organs, there's no sign that the supply is keeping up with the demand from aging Americans and those with chronic diseases. "The number of people on the waiting list is increasing faster than the number of donors, even with the increases related to overdoses," says Dr. David Klassen, chief medical officer at the United Network for Organ Sharing, which tracks and manages organ donations in the U.S. There are likely many more organs available from the victims of drug overdoses than those collected. Some patients addicted to heroin or other opioids don't carry a driver's license, haven't spoken to a family member about their end-of-life wishes, or aren't in touch with family members who could give consent to donate an organ. "I've never heard anyone talk about organ donation as a possibility. I'm not sure it's on their radar screen," says Dr. Jessie Gaeta, chief medical officer at the Boston Health Care for the Homeless Program. Gaeta says she isn't sure how she would suggest organ donation, even to her high-risk patients. "It's really nihilistic to say that to someone in their early 20s," Gaeta says. "I have so much hope for my patients, yet if someone does die and there's a chance for their organs to be helpful, that's one good thing to come of a death like that." Debbie Deagle holds a photo of her son Stephen and herself. For many mothers and fathers, sisters and brothers who've lost someone to an overdose, organ donation is a nearly taboo topic. It can trigger feelings of guilt, anger and despair, even among people who participate. 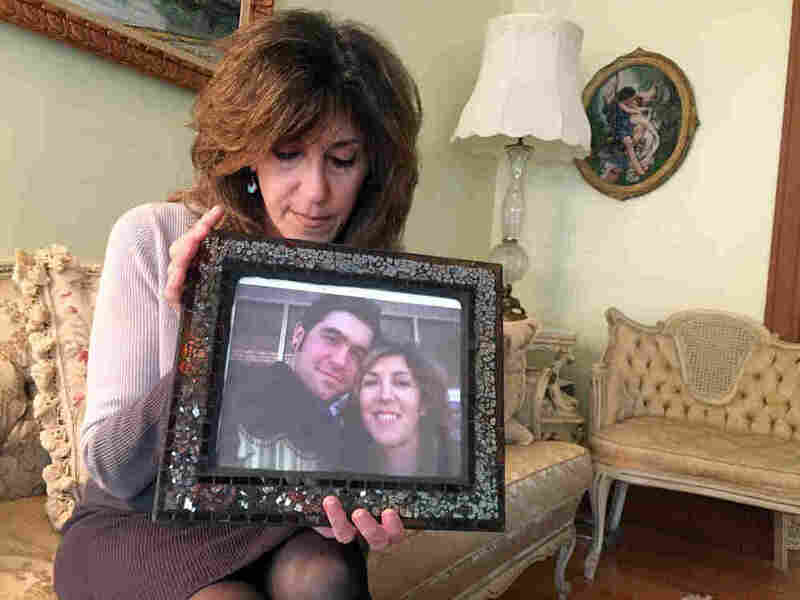 Debbie Deagle sat next to her son Stephen's unresponsive body for six days before agreeing to turn off his respirator. "Before they took him," Deagle says, weeping, "I had my head on his heart, just so I could hear that beat, and they had to peel me off." More than a year later, Deagle is still haunted by questions: Should she have asked for another opinion about the scans of Stephen's brain? "Never in a million years do you ever visualize kissing your child whose heart's beating and having to watch them wheel that stretcher away and know they're going to cut him open and take out a beating heart," Deagle says. The transplant patient who received Stephen's heart did not make it, leaving Deagle with the feeling her son had died again. She has written to the patients who received Stephen's liver and kidneys, but has not heard back.